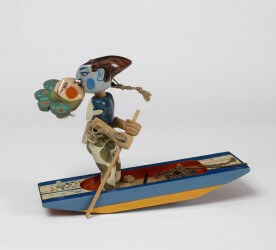 Carved wooden boat containing a painted red male figure sat opposite his bridge in a veil, rowing with two oars. Carved soft and hard woods, natural and painted, with rope, string, shells, feather, glass bead, lace, brass pin, tacks, net, fabric and ribbon. 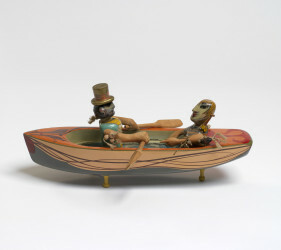 The figures are brought together and articulated by cod or hambro line. The paint used is mainly Plaka with plastic emulsion for the large areas, with a priming coat and a finishing coat of clear varnish. 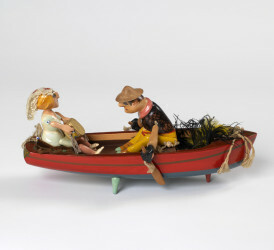 A second groom being rowed across the lake by his third bride, Sam Smith, 1972-73, Crafts Council Collection: W1. Photo: Todd-White Art Photography. 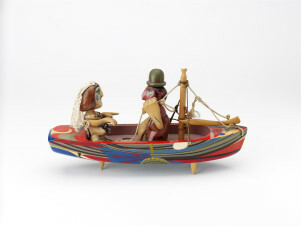 Box with 'A second groom being rowed across the lake by his third bride', Sam Smith, 1972 - 1973, Crafts Council Collection: W1. Photo: Stokes Photo Ltd. 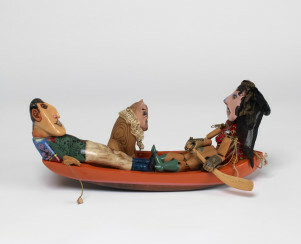 Box for 'A second groom being rowed across the lake by his third bride', Sam Smith, 1972 - 1973, Crafts Council Collection: W1. 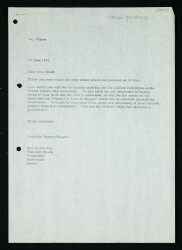 Photo: Stokes Photo Ltd.